5th – Birth of Syeda Zainab binte Ali(a.s.) – 5 A.H.
One who recites will have guaranteed safety for his life, wealth, and family for the full year. If he dies, he will achieve the reward/thawaab of a martyr. 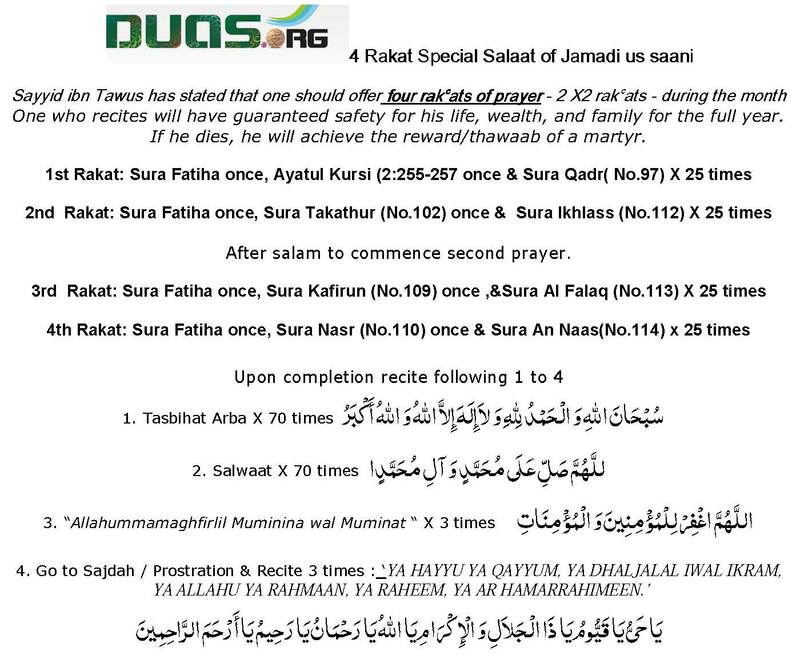 After salam to commence second prayer. YA HAYYU YA QAYYUM, YA DHALJALAL IWAL IKRAM, YA ALLAHU YA RAHMAAN, YA RAHEEM, YA AR HAMARRAHIMEEN. O Allah, send blessings to Muhammad and the Household of Muhammad. O Allah, (please do) forgive the believing men and women. O most Merciful of all those who show mercy! Then, one may pray for granting one’s requests.